This is probably the most complicated project that I had a chance to do ever. 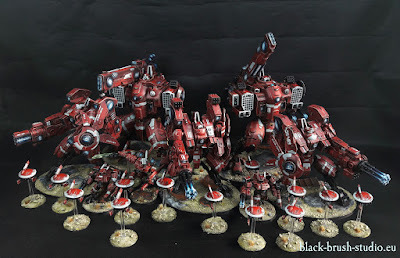 Each model of this army is fully magnetized. Each model has access to all weapons, some of them can also change the head, like a Draigo for example (sic!). Some numbers: over 330 magnets, over 70 force weapons (each painted with force-NMM style), over 130 add. bitz.... Seriously, very exhausting project ;-) but in overall I think they look great. What do you think? Some WIP photos. Also after taking an "official's" photos I've made some changes. Like a Crux Terminators symbols -> I've added some bleached colors to create better contrast between stone symbols and metalics-grey armor. That's obviously a new knowledge for me. I have get a lot of ideas about how training are done, what elements are used most likely and all. From a website addition about military bases in virginia, I gathered a lot of knowledge about this.